Lily Melrose - UK Style and Fashion Blog: omg first page! Does anyone else have trouble with writing on the first page? I always find it a really daunting thing to actually write or draw something on it. I always feel like if I mess it up the rest of the book with be messed up too. Ive been known to rip the first page out and redo it because the first page wasn't good enough. 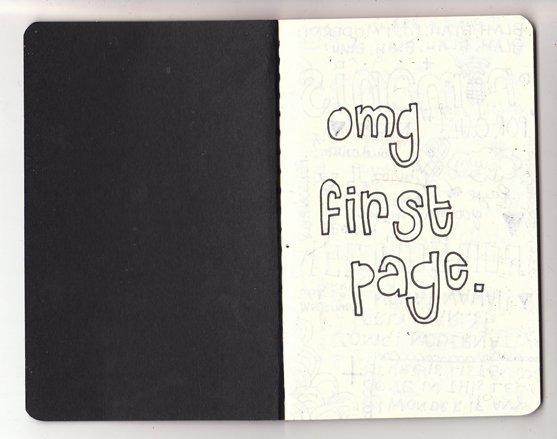 When I was at school I used to avoid the first page, Hahah I sound like such a weirdo? I uploaded a few pages from my Moleskines on Flickr if anyone is interested! I know what you mean haha. Nice blog! Happens to me all the time, I'm into perfection. totally agree with the whole first page business! i was the same at school when i got new exercise books or if i ever buy notebooks these days or whatever. my writing is the scruffiest ever though so either way it always looks a total shambles! YES! I hate that. I tend to draw a little drawing and write my address in it in case I lose it... nothing serious on the first page, please. Too. Daunting. If you want to split the principles, you ought to at the very least know them initial. Without knowing the fundamentals you're doing on your own along with your function an incredible disservice. One can learn about portrait digital photography by just browsing the world wide web. When you are planning on producing photography your own employment Michael Kors Replica, make sure that you have got a digicam with as much characteristics as you can. The simplest way to get crystal clear photos to get the digicam with the absolute best technology cheap gucci outlet. In case you are unclear that video cameras would be best, you should check on the internet reviews. Test out various rates of speed for the camera's shutter. Do not be fearful of hurting Michael Kors your gear. Pace it and steady it straight down. Discover how the interest rate effects the final picture hermes replica handbags.